Training your crew to be safe around hydraulic hoses is serious business. Quality hydraulic hose assemblies from your local Fall River industrial supply can be helpful, but you need to take a proactive approach. Safety tips for hydraulic hoses can be found all over the internet, through the equipment manufacturer, and through OSHA resources. Hydraulic hose safety in Fall River and the surrounding area is nothing to take lightly. The more you can do concerning scheduled hydraulic hose inspections and awareness instruction for workers; the safer everyone will be at your place of business. 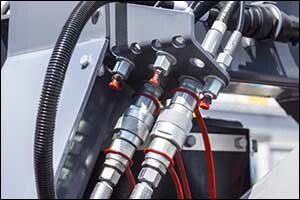 The first thing you need to understand about hydraulic hoses is that while they are designed to be strong, durable, and not leak, after considerable wear and tear, they need to be replaced. Preventing a leak or other type of serious failure is important. Regular inspections, ongoing maintenance, and replacements as soon as an issue is detected can help to reduce safety concerns. Hydraulic hoses are used on everything from big rig trucks to agricultural equipment, drilling rigs, and heavy-duty construction gear. They are used in manufacturing plants and out in the field. Designed to transmit force from one end of the hose to the other, pressure plays an important part in hydraulic hose inspections. Hydraulic hoses are designed to bend, making them easily adaptable to tight spaces and have the ability to travel long or short distances, depending on the application. In some situations, hydraulic hoses are designed to make it more convenient for the user. As a result, environmental influences, abrasive setups, and tight bends can significantly reduce the life of hydraulic hoses. As a result, many safety tips for hydraulic hoses recommend avoiding tight bends and other situations where the hoses may become damaged and pose a risk to operators and other workers. Hoses that are over-flexed, twisted, kinked, stretched, or crushed need to be replaced as soon as they are discovered. Fluid can seep from a bad connection or it can spray from the hose as a result of excessive wear. Without hydraulic hose inspections and ongoing maintenance, a failure could occur. When hydraulic fluid is leaked in any way, it can result in very serious injuries. Because of the immense pressure and temperature used with hydraulic fluid, the injuries could even be life-threatening. Skin burns, punctures from high-pressure fluid, and whipping hoses as a result of a rupture can cause a myriad of problems. A quick review of hydraulic hose safety in Fall River is often not enough to get the message through to workers. It is important to thoroughly explain all of the risks, dangers, and seriousness of safety protocol and first-aid procedures following a hydraulic hose failure. The best way to keep your crew safe when working with hydraulic equipment is to prevent hose leaks from happening in the first place. When you work with a trusted Fall River industrial supply to provide you with quality hoses that are properly sized and fitted for your specific needs, it goes a long way to increase the life of the hydraulic hose assembly. However, beyond the purchase of hydraulic hoses, fittings, and assemblies, it is important to ensure proper installation and ongoing hydraulic hose inspections on a regular basis. Regular inspections and preventive maintenance should be performed according to the manufacturer’s guidelines. However, if you use the machinery or equipment above and beyond the typical use, you should step up inspections and maintenance accordingly. A basic inspection should include a check that the hose type, length, and diameter are correct to prevent abrasions. Ensure that hoses are mounted properly with all of the correct supports, fittings, and restraints to prevent rubbing and chafing during use. Check the outer lining to ensure that there are no abrasions, cuts, tears, or breaks in the surface. Water can easily penetrate a worn out or broken lining and cause corrosion within the reinforced layer in between the inner tube and the outer protective layer. Once corrosion occurs, the hydraulic fluid can easily make its way out of the inner tube and cause damage or injury in the process. Check to see that both ends are clean both inside and out and that there has not been any damage to any of the included components. If you are in need of top quality Fall River industrial supply, visit our shop in New Bedford. We have a wide variety of standard and custom hydraulic hoses available and can even build a hose according to your specifications while you wait. Give us a call at 508-996-8400 to speak with one of our technicians. Make sure to stay on top of safety tips for hydraulic hoses and perform hydraulic hose inspections on a regular basis. The more you can do to establish hydraulic hose safety in Fall River; the safer your workers will be when they work with hydraulic equipment.